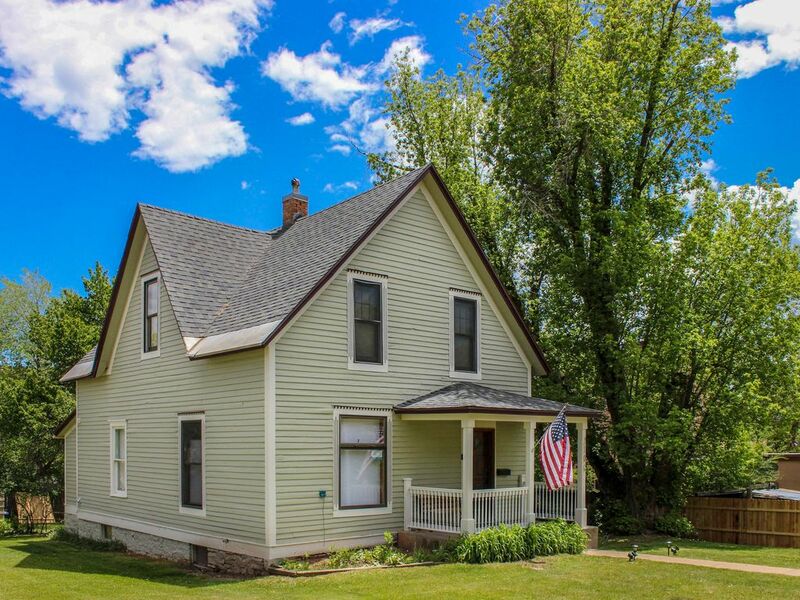 The best of Durango will be at your fingertips in this three-bedroom Victorian home, a beautifully updated historic property with a private deck and porch, an expansive yard, and an outstanding location close to hiking trails, a beloved local bike path, and the banks of the Animas River. This two-level home sits just two miles north of downtown Durango, which you can easily reach on the Animas River bike path only three blocks away. You'll be only one block from Main Avenue, three blocks from Memorial Park on the riverfront, four blocks from the Animas Mountain Trailhead, and 25 miles south of the ski slopes of Purgatory Resort. Whether you're vacationing with your family or enjoying a couples' getaway, the thoughtful furnishings, high ceilings, and bright rooms will make you feel at home. Recuperate from an invigorating morning hike by reading the newspaper on the leather sofa, using the WiFi to post a few photos, and watching your favorite cable shows on the flatscreen TV. Prepare homemade pancakes and scrambled eggs in the full kitchen, a welcoming space that blends charming country decor with sleek stainless steel appliances. Throw some strawberries and bananas in the blender, sip a cup of coffee in the breakfast nook, and set the six-person dining room table for breakfast in the light of the south-facing window. Stack the plates in the dishwasher for easy cleanup and head outside to enjoy the Southwest Colorado sunshine. Bring along your bikes for a two-mile ride into downtown Durango, watch your children as they play tag in the yard, or get lost in a novel on the back deck. Come mealtime, you can flip burgers and hot dogs on the gas grill and gather for lunch around the patio table. As the day comes to an end, throw your biking and hiking clothes in the private washer/dryer and take a seat on the front porch with a cold beer or a glass of wine. The kids can retreat to the den just off the dining room, where they'll find a comfortable couch and a second TV to watch a few family favorites. With three bedrooms and two full bathrooms, this valley view home will accommodate as many as six guests. Head upstairs to find the master suite, which features a queen-size bed, a flatscreen TV, and an attached bathroom with a claw-foot tub and a hand-held showerhead. The two guest rooms offer a queen-size bed and a pair of twin beds, respectively, while the second bathroom adjacent to the kitchen has a stand-up shower. Thanks to its ideal blend of valley views, close proximity to nature, and in-town convenience, this home is the perfect base for discovering the beauties of Durango. Head three blocks east to picnic on the shores of the Animas River in Memorial Park, or follow the waterfront bike path to peruse the shops, restaurants, and entertainment in the heart of downtown Durango. Spend winter days on the slopes of Purgatory to the north, where you'll have 94 trails, five terrain parks, and an always-entertaining tubing hill to choose from. Head 20 miles east to go boating, fishing, or cross-country skiing at Vallecito Lake, or take an unforgettable trip back through time in the incredible cliff dwellings of Mesa Verde National Park just 37 miles west. Immerse yourself in the outdoor wonders of Southwest Colorado - make this Durango vacation rental your next home away from home! Parking Notes: Please park in the two spaces in the alley behind the house. The updated bathrooms were outstanding and the charm can’t be beat. This was a beautiful old house, with ample room for our family of four. I imagine 6 people could easily sleep here, the kitchen was well supplied and the beds were very comfortable. Very quite location but extremely convenient to everything, grocery store, coffee and the trailhead to Animas Mountain trail were all a very short walk from this property (say under 5 min). Property manager was very responsive, grill was out of propane and within 20 min of calling he came and replaced it. We loved Durango and plan on visiting again and will absolutely be hoping this property is available when we do. Close to river & walking path, grocery store, as well as downtown. Very clean, easy to follow instructions from start to finish. Very nice. Four of us stayed for three nights & found everything just as it had been described, instructed, or read from previous reviews. Appreciated the little instructions posted where needed, as opposed to a "book" of instructions. Just FYI to homeowner/management, the rear lock box did not open with our code. The House was great. Loved everything about but the location. We wish it was closer to Main Street downtown. I would still highly recommend it.